Kim Antonelli makes last minute adjustments before an evening as Santa at a private party. 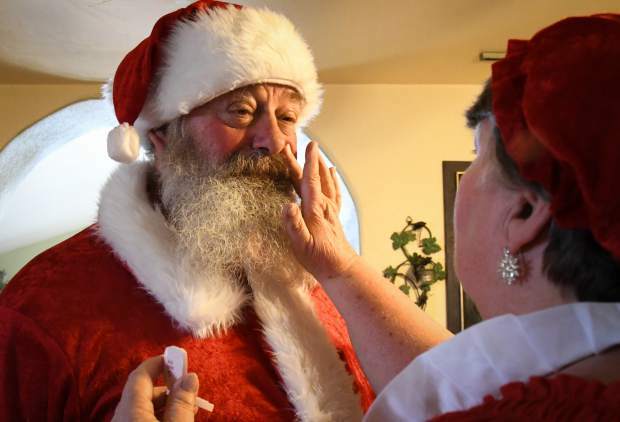 Kim Antonelli's wife Waynetta applies red make-up to give the appearance of a rosey-red faecd Santa. 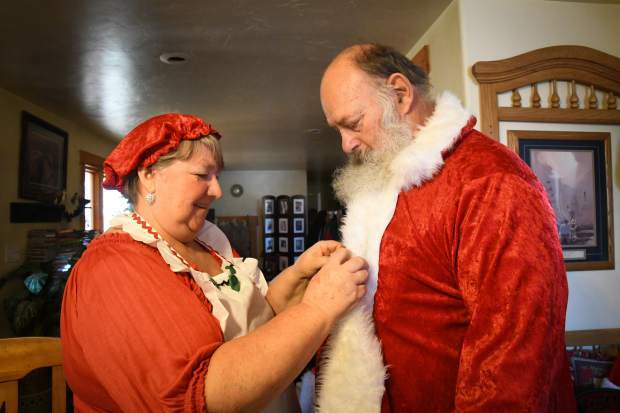 Antonelli's wife Waynetta helps him get ready for a gig as Santa in their home in Silt. 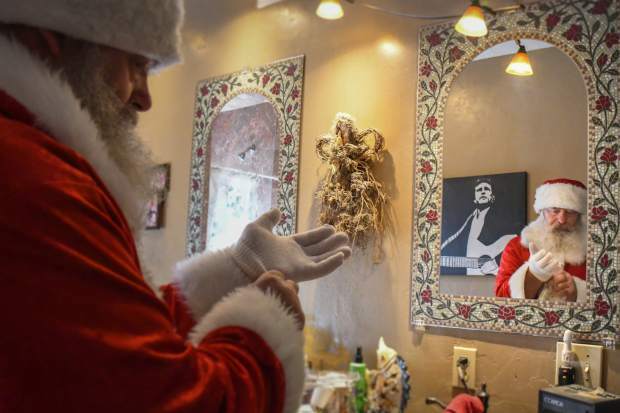 Kim Antonelli prepares for an evening as Santa Claus at his home in Silt. 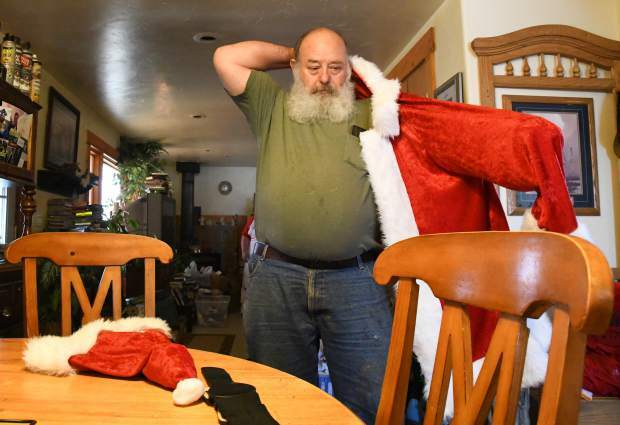 Kim Antonelli puts on his handmade Santa suit to prepare for a even as Mr.Claus at a private party. 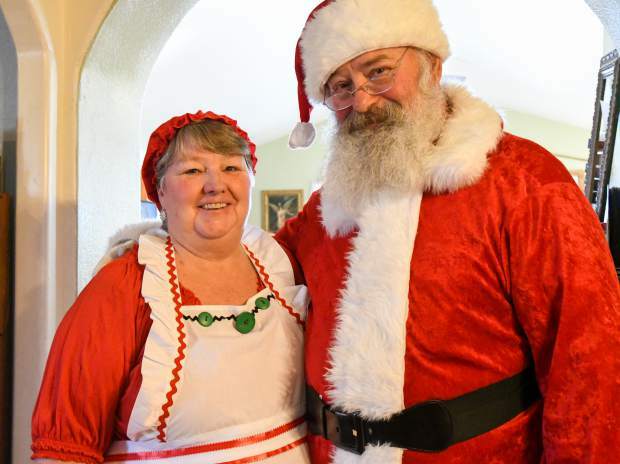 Kim and Waynetta Antonelli in their handmade Santa and Mrs.Claus suits at their home in Silt. 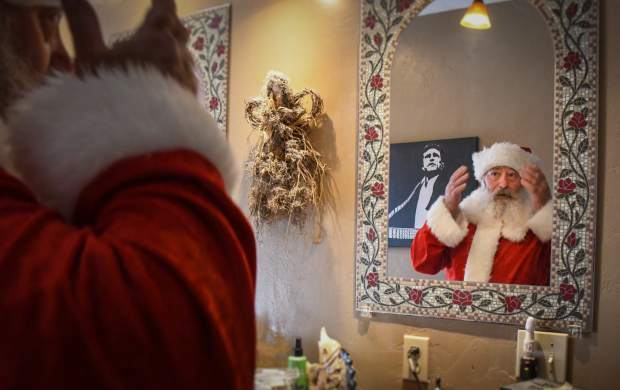 Kim Antonelli adjusts his hat in the mirror while preparing for an evening as Santa at a private party. 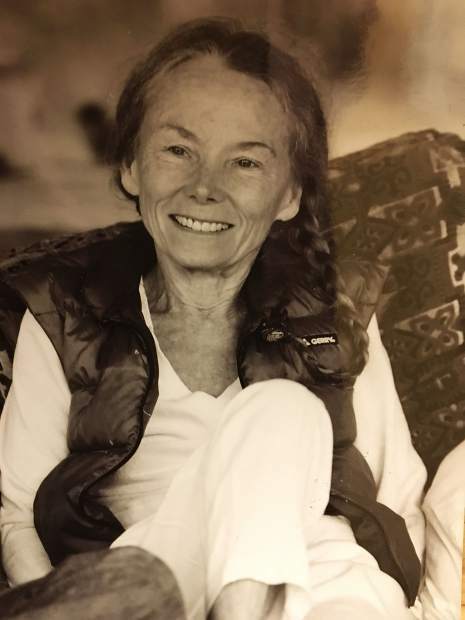 From monkeys to Legos and even bacon, Silt native Kim Antonelli has been asked for it all while playing the role as Santa Claus over the years. It all started at a church harvest party, when Antonelli and his family showed up to the costume party dressed as Santa and his helpers. 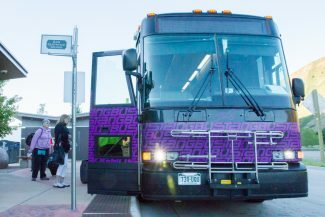 Year-round, Antonelli is the owner and operator of the Holy Cow meat processing company, located in the basement of his home. His Santa suit, handmade by two of his daughters, makes its way out of the closet every December, and the magical moments start flowing seamlessly. 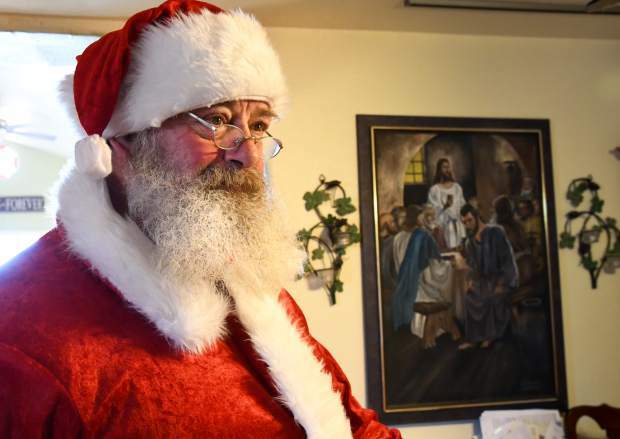 Antonelli has been playing the role of Santa for six years, and has taken part in Glenwood Springs’ Grand Holiday celebration for five. It’s the joy and excitement displayed on the faces of the kids that have kept him suiting up year after year. Antonelli makes it a goal with every kid to give them their own personal one-on-one time to make them feel special, as if they are the only one who matters right then. 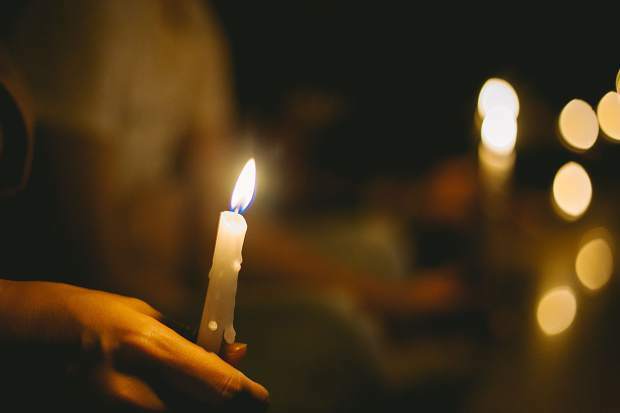 Kids say and ask for the darnedest things, and that doesn’t stop when it comes to conversations with Santa. Another little girl said all she wanted was all the boys and girls to have clean water and food. Antonelli added that a lot of kids ask for iPhones and iPads, and he tells them he can do his best but can’t guarantee anything. “One little kid asked me what I ate for Christmas dinner. 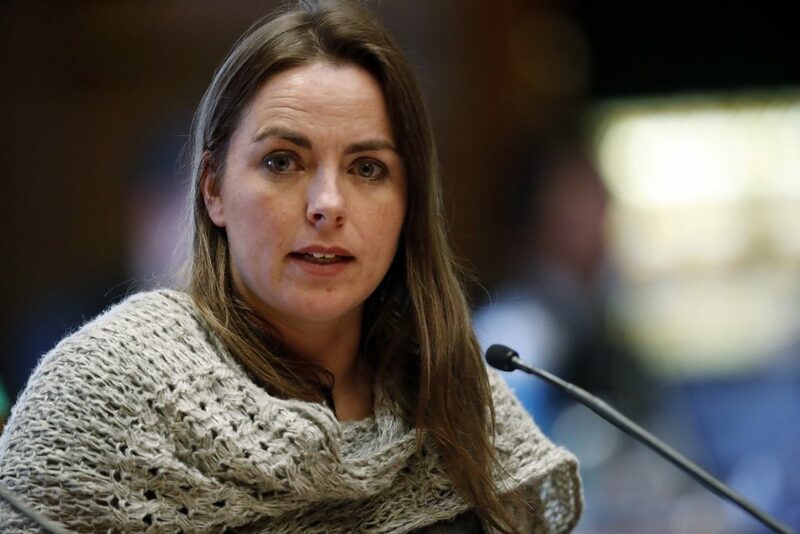 I didn’t tell him reindeer,” Antonelli said. 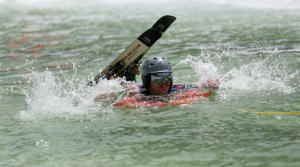 “Unless you try it and do it, you wouldn’t really understand that feeling,” Antonelli said.